According to the graph generated by the Cherry method, freeze-up occurred on or about November 12 in 1991 and 1993: this was the earliest freeze-up date recorded between 1991 and 2009. The latest freeze-up dates occurred in 1998 and 2009, on or about December 6. How does this compare to CIS weekly ice development graphs from 1981 to 2013, such as PBI used to support their allegation of “one day later each year”? Not bad, as it turns out. This year, polar bears were testing out the ice and starting to hunt by November 13 [week of Nov. 12], when ice coverage was ~5% (according to the graph for the week of Nov. 12). Because of this (and because we know that ice forms very rapidly after this point), I’ve marked the 5% level on all the graphs with a pink line and circled the mark for the 10% line (now the official “freeze-up” level as far as polar bears are concerned, according to Cherry et al. 2013). PBI says bears had basically left the shore by Nov. 20, and that ice extended at least 6 miles out into the bay by that date (see ice maps here). [Kelsey over at PolarBearAlley, on the ground near Churchill, contends that freeze-up occurred between 11th and 15th November, evidence that this is not a phenomenon that’s synchronized or uniform across the entire region. Kelsey has some thoughts on that too]. That said, ice coverage was ~10% according to the CIS graph for the week of Nov. 19 (Fig. 2), which is in good agreement with the predictions made by Cherry and colleagues in their paper: so far, so good. But to understand how ice coverage has changed over the last 30 years or so, we need to look at more than the graph for November 12, as PBI try to do. We need to see the ice graphs going back to at least the end of October (Fig. 1, below). Figure 1. Historic weekly ice coverage generated by the Canadian Ice Service for Regional Hudson Bay, for the week of October 29 (1981-2013). There were only 3 years (blue dots) when the ice had reached 10% coverage (1992, 1993 and 1990), the point when bears would have left the shore. The green line is the average for that week calculated by CIS (over 1981-2010), while the pink line (added) is the 5% level (rapidly forming ice). Note that 2012 and 2013 – as well as 2000, 2004, 2007, and 2009 – had average ice coverage by this date, about 1.5%. The top panel of Fig. 2 shows that the usual condition prior to 1991 was for freeze-up to occur the week of November 5: 7 out of 11 years had freeze-up the week of November 5. In fact, after 1991, it was normal for freeze-up to be completed by November 19 (Fig. 2, bottom panel): 17 out of 22 years had 10% coverage by that date. This is a difference of two weeks: 14 days or so. Note from the graph for November 19 that in 2009, ice coverage was only slightly below 10%. In 1998 and 2003, coverage had reached 5% by November 19, indicating ice development was well underway in those years as well. However, in 1998 coverage did not reach the 10% level until early December (which the Cherry et al. graph also shows). However, breakup that summer was very late (bears did not leave the ice until about August 22), which means that in 2009, polar bears did not spend any longer on shore than average. This means that there were only two years after 1991 (2006 and 2010) when freeze-up on Hudson Bay was not well underway by November 19. Figure 3. 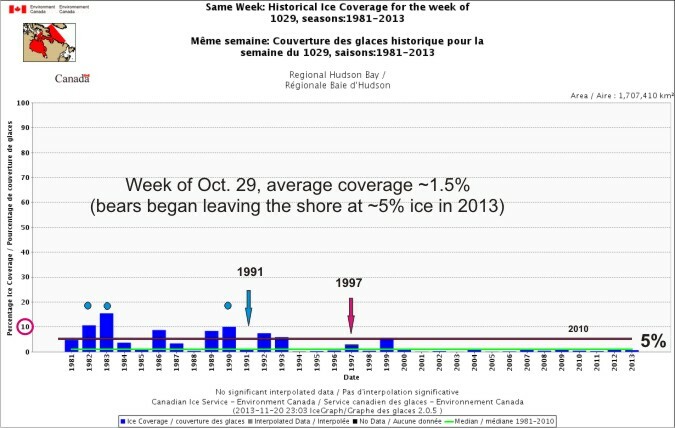 Historic weekly ice coverage generated by the Canadian Ice Service for Regional Hudson Bay. Upper panel is coverage for the week of November 5. Middle panel is the week of November 12. Lower panel is the week of November 19. The green line is the average for that week calculated by CIS (over 1981-2010), while the pink line (added) is the 5% level (rapidly forming ice). The 10% mark on the left scale is circled, indicating the line for new official “freeze-up” level as far as polar bears are concerned. Pink dots indicate years when ice coverage had reached 5% (rapidly forming ice) by that date; Blue dots mark years when the 10% level had been reached (official freeze-up level for polar bears). Click to enlarge. Prior to 1991, it was normal for freeze-up (10% coverage) to be completed by November 5. After 1991, it was normal for freeze-up to be completed by November 19, two weeks later. Freeze-up for the last three years (2011, 2012, 2013) was normal, completed by the week of November 19. The change in freeze-up dates relevant to polar bears over the 33 year historic record of 1981-2013 is about 2 weeks. This entry was posted in Life History, Sea ice habitat and tagged Amstrup, Canadian Ice Service, freeze-up, Hudson Bay, Polar Bears International, Seth Cherry, weekly ice graphs. Bookmark the permalink.